We can tell you that putting our summer influencer series has been a blast! 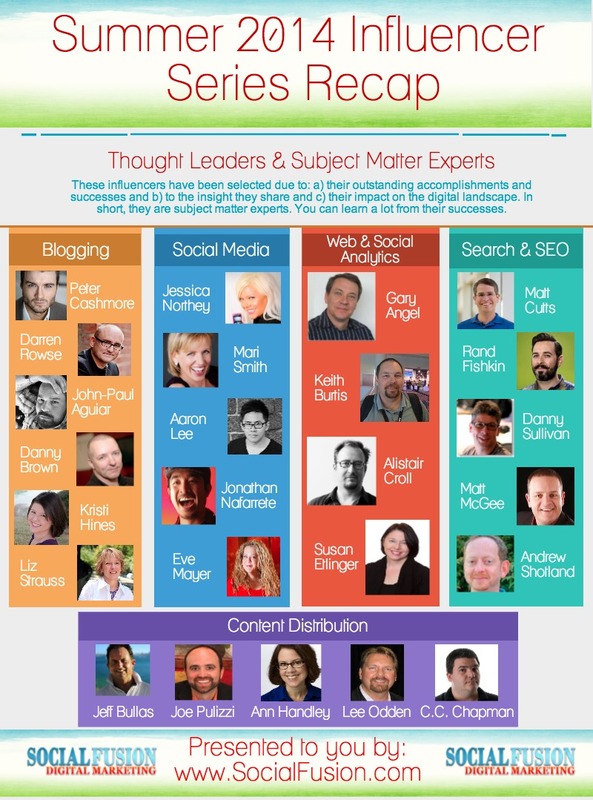 Week in and week out over this summer, we've highlighted a group of digital subject matter experts and influencers. The verticals we looked at included: social media, blogging, SEO, analytics and content distribution. All good things must come to an end and as we conclude this series, we want to leave it with a couple of questions to you. Do you agree with our influencer list? Who would you have added? Perhaps they will show up in our Summer 2015 influencer series. One topic we did not cover this summer was LinkedIn. However, if you would like to learn more about LinkedIn, please feel free to download our free LinkedIn workbook.